We come to the end of our fiscal year this weekend, and I am both grateful and hopeful for the mission of the Gospel which God has entrusted to us. I am grateful that God has deposited in us a rich gift in our theology of grace and the authority and living power of God’s Word to bring back to life what is dead. I am grateful that in response to this great Gospel, we are a sent people with a missionary DNA. I am also grateful that God is raising up leaders and congregations to share this precious gift given to us with neighbors near and oceans away. I am hopeful. This past week has been a potent and tangible reminder of the great mission potential God has deposited in us. After a weekend of meeting with leaders and partners of our mission on the gulf coast of Florida, I spent the next four days with a group of about twenty of our pastors, spouses and lay leaders at a conference in Orlando being equipped and encouraged for congregational revitalization and church planting. On the last evening of the conference, our group got together and spent a couple of hours sharing perspectives and passion for how they, and the Lutheran Brethren, might move forward together for the advancement of Christ’s Kingdom among us. I saw great hunger and resolve. I am very, very encouraged. In parallel significance, today I was greatly blessed to be part of a farewell to one of the bright influential leaders of another generation. I was present with other CLB leaders for the interment service at Arlington National Cemetery for Maj. Gen. G.T. Gunhus, a Lutheran Brethren pastor whom God raised up to become Chief of Chaplains for the US Army. It struck me significantly that a baton of mission has been passed on to all of us from faithful and fruitful hands. I believe our mission is far from done. I feel our neighbors and world need to hear more of our voice rather than less. 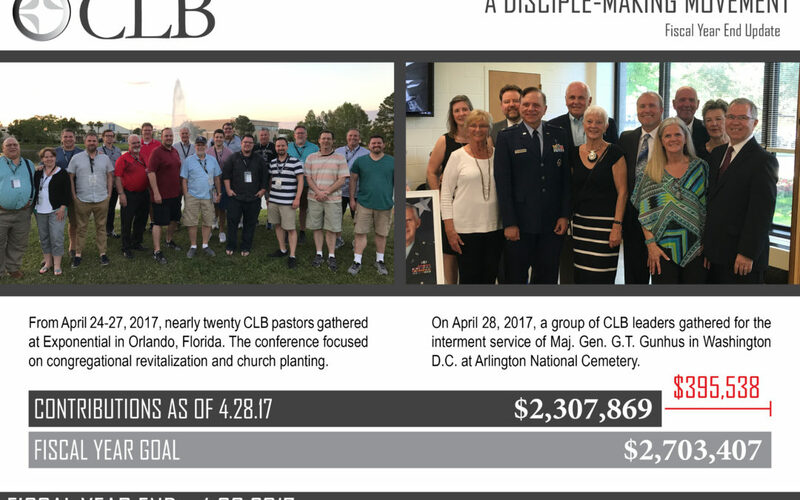 As you may know, the fiscal year of the Church of the Lutheran Brethren ends Sunday, April 30. I know many congregations and individuals are considering generous year end gifts. As of today, we are about $395K short of our $2.7M annual goal. I am hopeful and grateful. 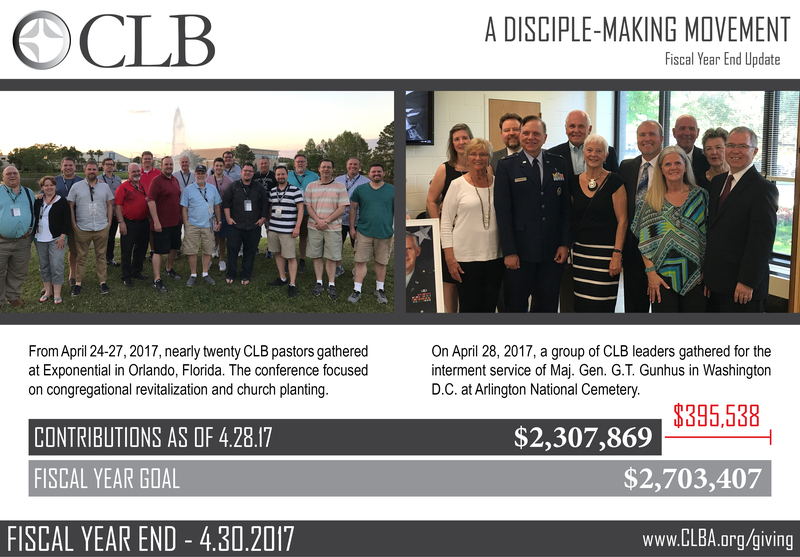 Your partnership in the advancement of our disciple-making movement within Christ’s great cause is effective and greatly appreciated.